(MENAFN - GetNews) HOUSTON, TEXAS - November 8, 2018 - G-Squared Events is excited to announce their upcoming event entitled 'Valentine's with Charlie Wilson and Kenny 'Babyface" Edmonds. The event will take place on February 16, 2019, at the Smart Financial Centre in Sugar Land, Texas. Doors are scheduled to open at 7:00PM and the event will take place at 8:00PM. Presale begins on November 17, 2018, at 10AM CT at Ticketmaster.com and at the Smart Financial Centre Box Office. Tickets will go on sale to the general public starting on November 19, 2018, at 10 AM CT. Ticket prices for the event range from $49.50 - $125. Some people might say that after notching eleven No. 1 singles, 11 Grammy Award nominations, a New York Times best-selling memoir and ongoing sold-out, coast-to-coast arena tours, Charlie Wilson has proven his point… and he isn't planning to slow down anytime soon. 'I've been in this game for many years, said the Gap Band founder and solo star. 'I've had some big hit records and sold a lot of records. But I need to still show people that I'm in it. It's championship time. Wilson underscores that declaration with his latest album, In It to Win It (P Music Group/RCA, Feb. 17, 2017) which was nominated for three 2018 NAACP Image Awards, Outstanding Male Artist, Outstanding Duo or Group Collaboration and Outstanding Album. The set boasts two number one singles which hit two different Billboard charts in April 2018. 'Chills was #1 on the Adult R & B Songs chart and I'm Blessed ft. T.I. was #1 on the Hot Gospel Songs chart. This is the first time an artist has had two different #1 songs on these charts at the same time. In addition, 'I'm Blessed was also nominated for a 2018 Billboard Top Gospel song and Wilson received a 'Rhapsody & Rhythm award from the National Museum of African American Music scheduled to open in Nashville in 2019. Coinciding with the release of the album Wilson's In It To Win It national tour sold out arenas around the country. He is continuing to tour with upcoming dates in Europe and the U.S.
'I'm Blessed' says exactly where I am in my life, blessed to still be making music that people want to hear, says Wilson. "2018 has been a tough year for so many people around the world, so I'm proud to release a song to remind us that we can all find some blessings in our lives. And having T.I. bring his flavor, sharing who he is and how his journey is filled with blessings, is an added bonus." Before launching his solo career in 2000, Wilson racked up a string of hits in the late ‘70s and ‘80s as front man with the Gap Band. The pioneering R & B/funk group charted such frequently sampled classics as 'Outstanding, 'Yearning for Your Love, 'Burn Rubber on Me, 'You Dropped a Bomb on Me and 'Early in the Morning. Wilson signed to Jive (now RCA) in 2004 after landing his first No. 1 Billboard Adult R & B hit in 2000, 'Without You. Since then, he's released six solo albums and become a consistent chart presence. His tally of 19 hits boasts seven more Adult R & B No. 1s. Among them: 'My Love Is All I Have, 'You Are and 'There Goes My Baby. 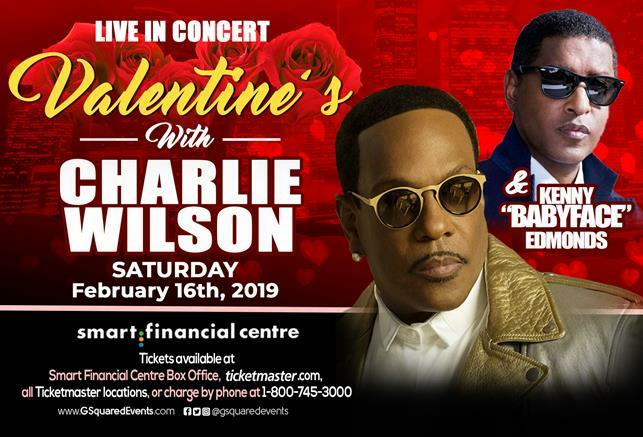 While garnering 11 Grammy nominations and other industry accolades, including BET's 2013 Lifetime Achievement Award, Wilson has stayed busy on the road, as he is a major concert draw, claiming the crown for top winter tour of 2015 with his Forever Charlie arena, or in the studio. In the years between the Gap Band's heyday and his solo success, Wilson survived drug and alcohol addiction, homelessness, and prostate cancer. He chronicled his odds-defying life and career in his 2015 best-selling autobiography, I Am Charlie Wilson. Sober now for 22 years, the singer says, 'I wouldn't have believed I'd be where I am right now. That's why I shout every night because I thank God for allowing me to be here. Wilson continues to perform to rave reviews at his concerts. If you haven't seen a Charlie Wilson show, this is a show you don't want to miss. Kenny 'Babyface Edmonds' multi-faceted pop/urban career includes the consecutive multi-platinum landmark albums 'Tender Lover, For the Cool in You (including signature hits 'Never Keeping Secrets and 'When Can I See You) and 'The Day (Every Time I Close My Eyes). As co-founder with L.A. Reid of LaFace Records in 1989, Babyface nurtured the careers of such stars as TLC, OutKast, Usher and Toni Braxton. An 11-time Grammy Award winner, Babyface most recently released 'Return of the Tender Lover in December 2015, his first solo album in seven years. This latest project introduces a freer, less-structured Babyface putting his stamp on a contemporary sound he describes as 'unapologetic R & B. This album follows the critical and commercial response to his and Toni Braxton's 2014 Grammy-winning album 'Love, Marriage & Divorce. Based in Houston, Texas, G-Squared Events produces high-quality live entertainment experiences with some of the world's biggest performers including Charlie Wilson, Tyrese, Steve Harvey, Keith Sweat, and Brian McKnight. For over 20 years, G-Squared Events has leveraged data-driven insights with our event production expertise to deliver world-class events while earning enduring loyalty from our patrons, artists, and venue partners. G-Squared Events is listed on the 2018 Pollstar Midyear Worldwide Ticket Sales Top 100 Promoters. To learn more, visit GSquaredEvents.com .